Get your 1" x 1" Dash Cryptocurrency Pin and show your support for the first autonomous decentralized self-promoting crypto currency. The organizing of Dash's promotion is built into a self-governing and self-funding algorithm that enables the Dash network to grow. It's a crypto currency designed to scale, be fast, and cheap! 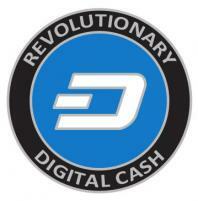 Dash is one of the few crypto currencies other than Bitcoin, Bitcoin Cash, Lite Coin, and Zen Cash that have seen real world adoption by merchants thanks to retail apps such as AnyPay and CoinPayments. It's design makes it a revolutionary way of promoting the interests of crypto currency users without the reliance on other's generosity.